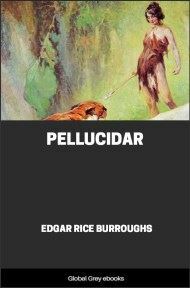 This is the fifth book in the Pellucidar Series. 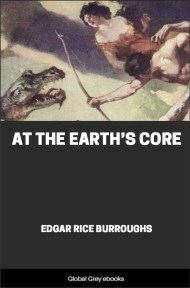 Five hundred miles beneath the surface of the Earth lies another world - a world of eternal day and endless horizons, in which dinosaurs still roam and cavemen hunt and terrors forgotten in the outer world still survive. 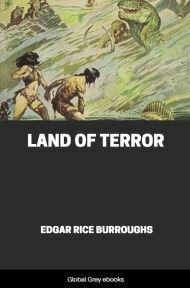 Lieutenant von Horst, member of an exploring expedition, was left behind in this lost land of Pellucidar. 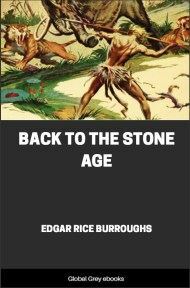 Back To The Stone Age is the thrilling story of his perilous adventures, along with the cavegirl he loved, in that primitive unknown world. 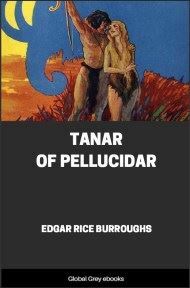 The eternal noonday sun of Pellucidar looked down upon such a scene as the outer crust of earth may not have witnessed for countless ages past, such a scene as only the inner world of the earth's core may produce today. 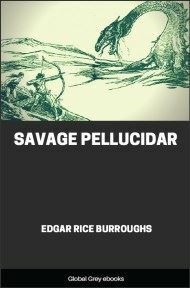 "It doesn't seem possible," exclaimed Gridley, "that five hundred miles below our feet automobiles are dashing through crowded streets lined by enormous buildings; that there the telegraph, the telephone, and the radio are so commonplace as to excite no comment; that countless thousands live out their entire lives without ever having to use a weapon in self-defense, and yet at the same instant we stand here facing saber-toothed tigers in surroundings that may not have existed upon the outer crust since a million years." "Look at them!" exclaimed von Horst. "Look at what they've driven into this clearing already, and more coming." There were great ox-like creatures with shaggy coats and wide-spreading horns. There were red deer and sloths of gigantic size. There were mastodons and mammoths, and a huge, elephantine creature that resembled an elephant and yet did not seem to be an elephant at all. Its great head was four feet long and three feet broad. It had a short, powerful trunk and from its lower jaw mighty tusks curved downward, their points bending inward toward the body. At the shoulder it stood at least ten feet above the ground, and in length it must have been fully twenty feet. But what resemblance it bore to an elephant was lessened by its small, pig-like ears. "There is still one opening ahead of us, bwana," said Muviro, the black chief of the Waziri. "We shall have to run for it," said Gridley. "The beasts are all headed in our direction now. Give them a volley, and then beat it for the trees. If they charge, it will be every man for himself." "Here they come!" cried von Horst. Then the men broke into a run as they sought to reach the trees that offered the only sanctuary. Gridley was bowled over by a huge sloth; then he scrambled to his feet just in time to leap from the path of a fleeing mastodon and reach a tree just as the main body of the stampeding herd closed about it. 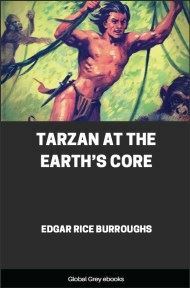 A moment later, temporarily safe among the branches, he looked about for his companions; but none was in sight, nor could any living thing so puny as man have remained alive beneath that solid mass of leaping, plunging, terrified beasts. Some of his fellows, he felt sure, might have reached the forest in safety; but he feared for von Horst, who had been some little distance in rear of the Waziri. But Lieutenant Wilhelm von Horst had escaped. In fact, he had succeeded in running some little distance into the forest without having to take to the trees. He had borne off to the right away from the escaping animals, which had veered to the left after they entered the forest. He could hear them thundering away in the distance, squealing and trumpeting, grunting and bellowing. Winded and almost exhausted, he sat down at the foot of a tree to catch his breath and rest. He was very tired and just for a moment he closed his eyes. The sun was directly overhead. When he opened his eyes again the sun was still directly overhead. He realized that he had dozed, but he thought that it had been for but an instant. He did not know that he had slept for a long time. How long, who may say? For how may time be measured in this timeless world whose stationary sun hangs eternally motionless at zenith?